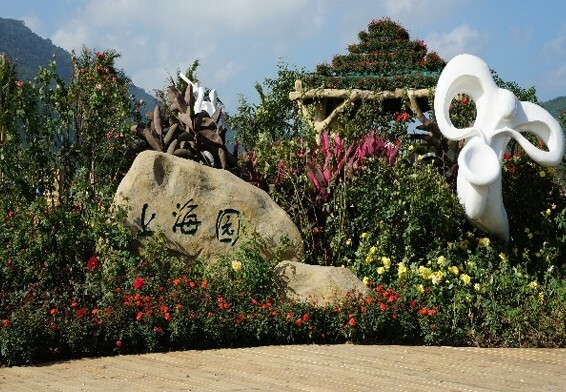 The fifth China Rose Show and Sanya International Rose Festival – organized by the World Federation of Rose Societies (WFRS), Sanya municipal government and Rose Branch Association of the China Flower Association – opened on Dec 12, 2012, in the International Rose Valley of Yalong Bay. Cai Youming, deputy director of the Shanghai Greenery and Public Sanitation Bureau; Wu Song, deputy head of Shanghai Chenshan Botanical Garden; and many other officials attended the opening ceremony. The representative works of Shanghai, titled Shanghai Garden, made by Shanghai Chenshan Botanical Garden won the silver prize in the Rose Setting Exhibition. Shanghai Garden was designed based on a rose garden theme, building an exquisite garden landscape by drawing from Shanghai culture. The open entrance is made of a wood platform with three characteristic arched, rose-lined doors. Inside, the garden is lined with ring roads along with various rose-themed settings, petal-covered roads and statues. The focus of the setting – Shuijing Pavilion (Water Admiration Pavilion)–sits at the edge of the water. Visitors can not only admire the nearby water, but can also enjoy the central statues, music and arched doors. Shanghai Garden highlights urban garden culture through its delicate garden landscape.